Day-to-day life is a grind. Waking up, going to work, coming home, remembering to feed yourself because you're supposed to be an adult now – and doing it all again the next day. And the next. Travel, on the other hand, is like pulling a cog out of machinery. It's a chance to shake up the status quo, see other things, and spend time with other people – or with yourself, if you're a solo traveller. I've been on planes since I was a year old. I absolutely adore exploring new cities, soaking up the people, the language, the architecture, the vibes and even the mundane, like different-sounding police sirens (and I don't care how weird that sounds). I even love planning trips, digging into research of the best things to see or do. My VR diary is about exploring VR for replacing or augmenting real-life experiences, so for this entry I set out to test the immersive power of VR – it does promise to transport you to entirely new worlds, after all – when it comes to bringing the marvellous spoils of travelling the world to my own living room. I decided to start small. This past November, I was in London for our very own Wareable Tech Awards. I had the weekend to explore one of the most beloved cities in the world, and one of the places I really enjoyed was the Victoria & Albert Museum. I'm a fan of museums, not necessarily for the art but for the history. These are places that hold works of some of the most interesting people who've ever lived. I've always found it humbling to be in the presence of that. To recreate that experience in VR, I turned to Boulevard, which partners up with museums and cultural sites to put together VR recreations of, well, museums and cultural sites. I was dropped into a little hallway that let me choose between a couple of sites, like the British Museum and de Young. I, however, chose the Victoria & Albert. Once I got past the niggling control scheme, I found myself in a small area filled with British paintings, and immediately I was blown away. It looked exactly as it looked when I was there. I could even see the glass door that I accidentally entered when I visited IRL, stumbling into an unfinished exhibit with employees putting together old Hollywood costumes. I would not be stumbling anywhere this time though, because sadly in VR the glass doors were locked. I could wander around the room and look at about a dozen paintings, but I couldn't leave that room. That made me feel like I was trapped in the museum, though Robin Williams and Ben Stiller would not be coming to keep me company. Regardless, I took a look at some of the paintings. I learned about one called Bulls Fighting, and I moved my head closer to take a look at some of the details, but there was something off. I wasn't feeling anything; I was bored. So I jumped out of the app and decided to do something a little more adventurous. Enter a trio of apps: Ascape, Travel VR and YouVisit VR. All of these will take you on little video adventures, but they go about it in different ways. YouVisit VR is more about unique experiences, like paying out the nose for VIP treatment on your travels kind-of-a-thing. For instance, it took me to New York Fashion Week, where I not only got to watch models strut down the runway, but I went down the runway myself! Or, well, I kind of did. Some model was holding out a tripod with a 360 cam on it, and I was at the end of it. The view was distracting, as it made me feel like a baby the model was carrying out onto the runway as a prop. It all went a bit Terrence Malick. Ascape is similar, but it feels like it's nickel and diming you. Each video adventure cost a buck or two, while the free ones are funded by a brand. I'm unlikely to go to Cuba anytime soon, so I decided to check out JetBlue's video on Havana. I took a quick tour around the city, and it certainly made me want to book a JetBlue flight to Havana (good job, advertising) but it also left me unfulfilled. I was happy to see Havana, but I wanted to feel Havana. I was jetting around Havana with a narrator in my ear and cheery music, which drowned out the natural sounds of the city and the people. Even when it showed me, say, a dance performance, the app didn't want to get out of the way. It just kept telling me things, and I wanted to scream at it to keep quiet for a second so I could just enjoy the sights. At least with a real tour guide they can read the room and see when people just want to soak things in. Somewhat dejected, I went on to Travel VR. This app gives you a big globe. You just look at a country, pull the trigger and go on a series of video adventures together. You're supposed to be able to move the globe to look at video, but that wasn't working so and I somehow ended up in South Africa, which is totally cool because my family and fiancé are from there. I was given a series of videos about Cape Town, a city that is both stunning and running out of water. I climbed Table Mountain, I sat at a restaurant by the beach, I walked the atmosphere-filled streets. It was a great time, and Travel VR's videos are good enough to make it feel like you're actually there and not on some hyper-edited tour with distracting music playing in the background. But it left me with two feelings. One, there was a weird disconnect knowing this is a city in crisis, threatened to be the first major city in the world to run out of water. Two, it made me miss my fiancé a lot. I'm actually headed to South Africa in a couple of weeks, and I know she has some things planned for when I arrive. That's what led me to Google Earth VR, which, by the way, takes an incredibly long time to load. You get some cool visuals of desert-y mountains, but boy is it patience-testing. Once things finally did load, I was treated to a beautiful digital version of the Earth. I immediately grabbed the planet and orientated it to South Africa, pushing forward on the joystick and flying in faster than one of Elon Musk's returning rockets. I settled in close on Durban, the coastal city that my family is from, then the most wondrous thing happened. It felt like I was flying over the city. 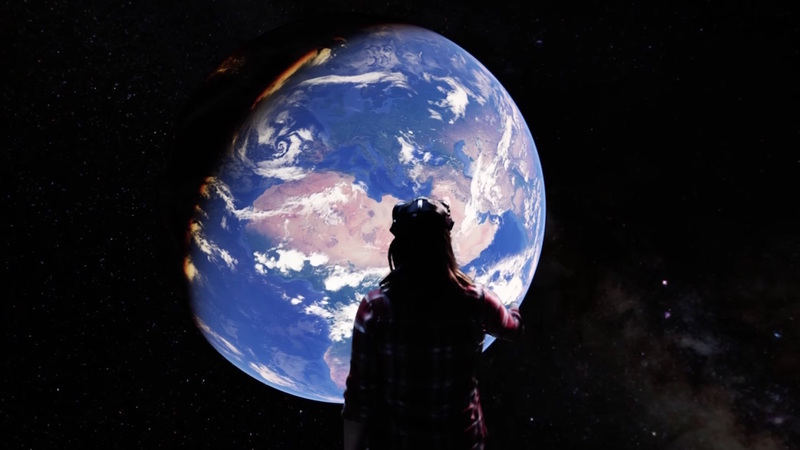 Google Earth VR has a soft, almost magical soundtrack playing while you're zooming around, and it just makes you feel like you're flying. As I flew around, I started recognising landmarks that brought back memories. I saw the beach where I watched USA sneak by England in the 2010 World Cup thanks to a goalkeeper's error, after which I randomly hugged many fellow Americans. I saw the ice cream shop my family took me to countless times when I was a kid. And I saw where I had my first date with my fiancé. It felt transformative and magical. I pulled myself out of my nostalgia trip and decided to get productive. I zoomed back out a little and observed the map, taking a look at potential places I could be visiting. I staked out the Botanical Garden and a couple of museums. I looked along the coast for good beaches. I checked the path from where I'm staying to the places I think I might be going. I did my research. Research! How could I forget research? My curiosity for my upcoming trip turned into a productivity session for a future one. I zoomed over to Hawaii to scout out locations for our honeymoon. I zoomed through the beautiful valley at Kualoa Ranch, and the astonishing shell of Diamond Head's former volcano. I tried to get into the weeds and search out some wonderful waterfalls, but it seems Google Earth had had enough of me. The magic was stuttering; my travelling was over. Though not in actual reality, of course. My travels were just beginning, and virtual reality had made me more excited for it. VR is a good preview of what you want to do when you are travelling. It can give you ideas, or a preview of a place that'll leave you eager for more. But VR can't replace the tactility of travelling. At its core, travelling isn't just about eating at popular restaurants or seeing touristy sites, it's about experiencing a new place. VR is a window, not yet a portal.